I intend to let the text and pictures do the talking for the remainder of these “Gorgoroth” entries (four in all). 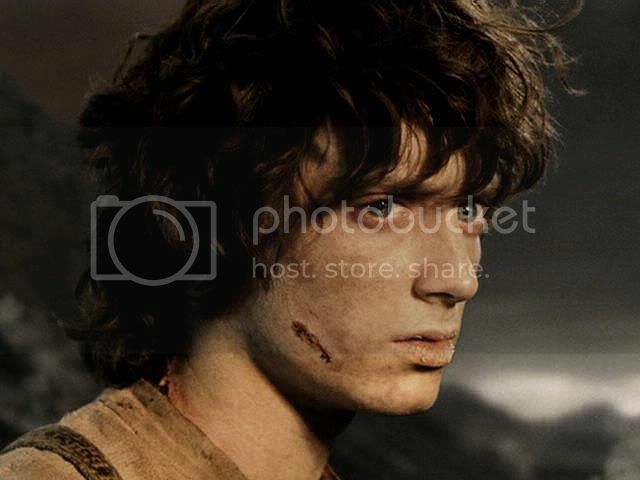 I am also including a poem by jan-u-wine in each of the entries, since she has written a number of excellent pieces that depict Frodo in this section of his story. Actually, I was inspired to make these screencaps because of reading her poem, Last Day (posted below the screencaps). 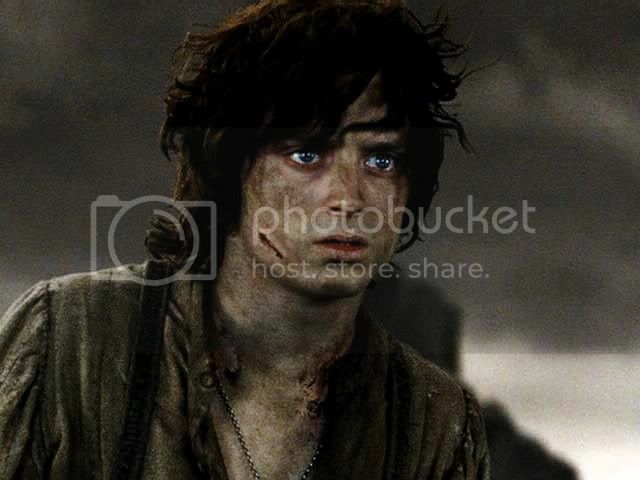 I have featured jan-u-wine’s poetry before, poems she wrote to go with Frodo Art Travesties. 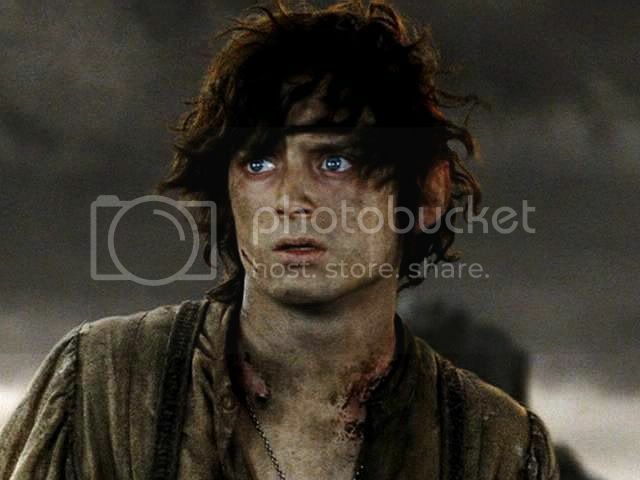 But of all her nuanced, deeply felt Frodo poetry, this poem may be my favourite of all. I have never read a portrayal of Frodo suffering on Gorgoroth that affected me more deeply or which lingered more in my mind. It was a land in which it would be possible to creep from hiding to hiding, unseen by all but the most watchful eyes: possible at least for one who was strong and had no need for speed. For the hungry and worn, who had far to go before life failed, it had an evil look. 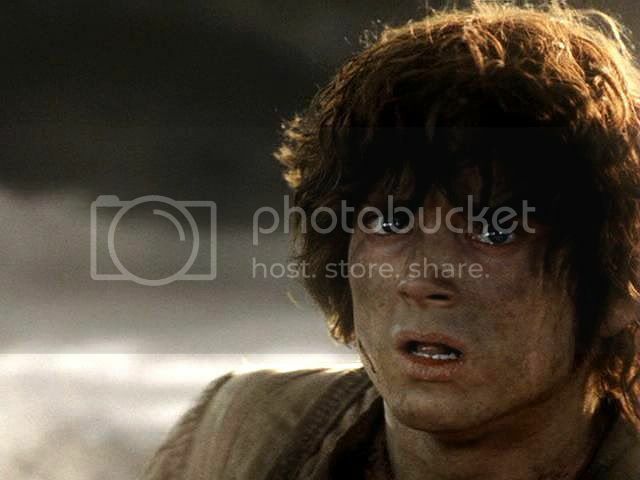 For the hobbits each day, each mile, was more bitten than the one before, as their strength lessened and the land became more evil. They met no enemies by day. At times by night, as they cowered or drowsed uneasily in some hiding beside the road, they heard cries and the noise of many feet or the swift passing of some cruelly ridden steed. But far worse than all such perils was the ever-approaching threat that beat upon them as they went: the dreadful menace of the Power that waited, brooding in deep thought and sleepless malice behind the dark veil about its Throne. Nearer and nearer it drew, looming blacker, like the oncoming of a wall of night at the last end of the world. There came at last a dreadful nightfall; and even as the Captains of the West drew near to the end of the living lands, the two wanderers came to an hour of blank despair. Four days had passed since they had escaped from the orcs, but the time lay behind them like an ever-darkening dream. All this last day Frodo had not spoken, but had walked half-bowed, often stumbling, as if his eyes no longer saw the way before his feet. 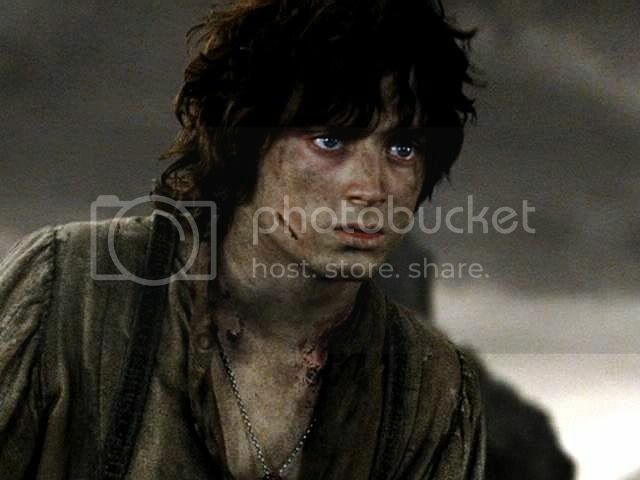 Sam guessed that among all their pains he bore the worst, the growing weight of the Ring, a burden on the body and a torment to his mind. Anxiously Sam had noted how his master’s left hand would often be raised as if to ward off a blow, or to screen his shrinking eyes from a dreadful Eye that sought to look in them. And sometimes his right hand would creep to his breast, clutching, and then slowly, as the will recovered mastery, it would be withdrawn. 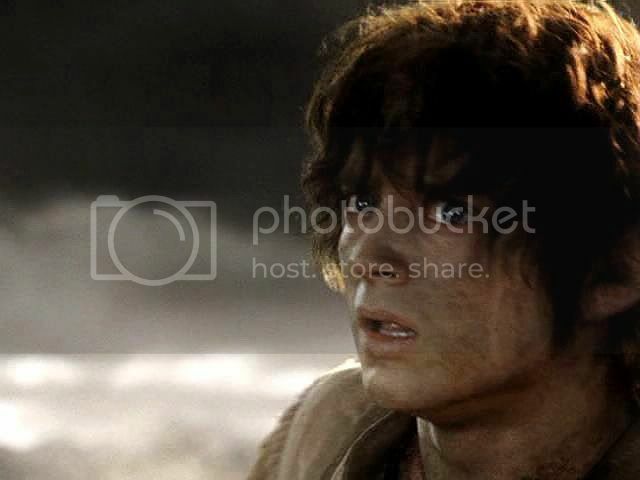 Now as the blackness of night returned Frodo sat, his head between his knees, his arms hanging wearily to the ground where his hands lay feebly twitching. Sam watched him, till night covered them both and hid them from one another. He could no longer find any words to say; and he turned to his own dark thoughts. ~ From “Mt. Doom”, The Return of the King. but surely not as welcome. trickles red lacings from his lips. he must needs relieve himself. beneath a burden of gold. Forward to Pt. III of Gorgoroth caps. Back to Pt. I of Gorgoroth caps. Jan-u-wine's poem is really powerful stuff. Este, thank you for commenting (and so swiftly, too! I haven't even opened the mushroom link!). Yes, Jan's poem is ... "powerful". 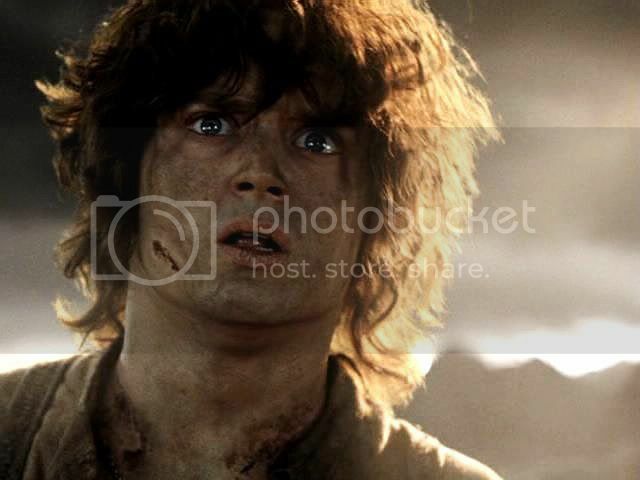 I have never read such a naked portrait of Frodo, yet one that lets him keep his dignity in spite of letting us know such things. I find him utterly, utterly "human" in this poem; "human" in his pathos and vulnerability and bodily frailty, but also so DAMNED noble!!!! 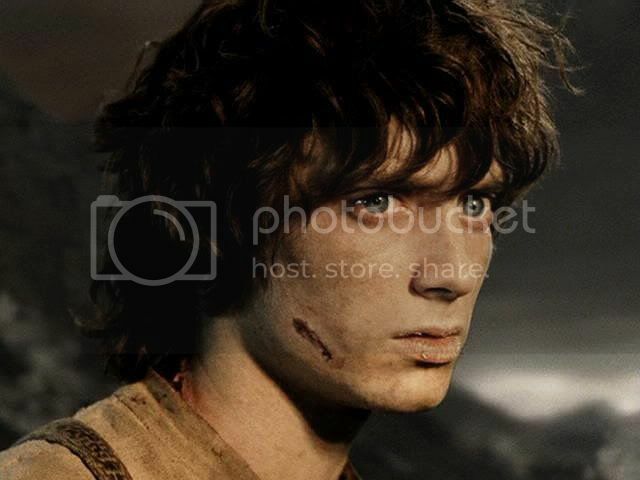 I could fall all over him and mother/sister/lover/friend him to death, except he'd be killed. Oh dear - the screencaps are as heartbreaking as the poem. They both are really powerful. I hadn't planned to screencap this scene, thinking it had been screencapped to death. But Jan's poem stirred me to look at it again. 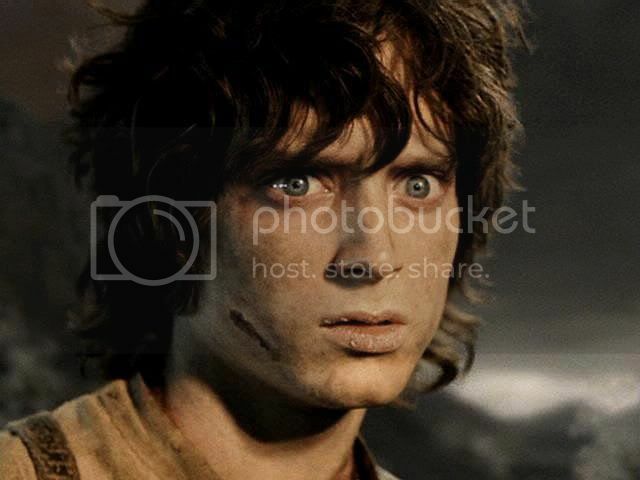 As I moved from frame to frame, I was wowed all over again by the beauty of the frames and the expressiveness of Frodo's face in them. After I brightened and sharpened them, I thought they were total swoondom for the angst lover in me. 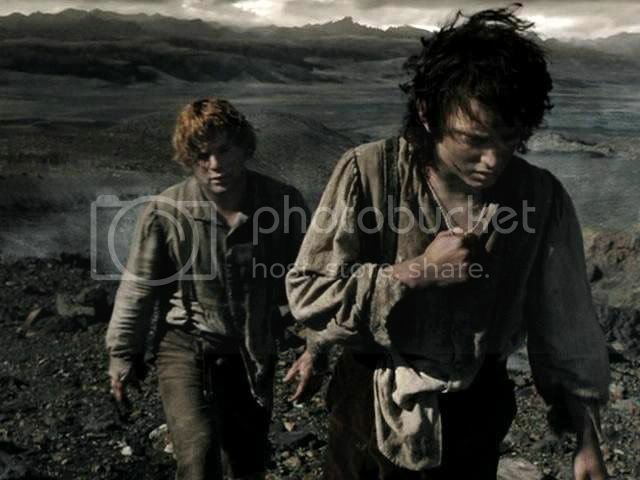 Gorgeous pictures for one of the most heartbreaking moments in the movie. Thank you, Melyanna. 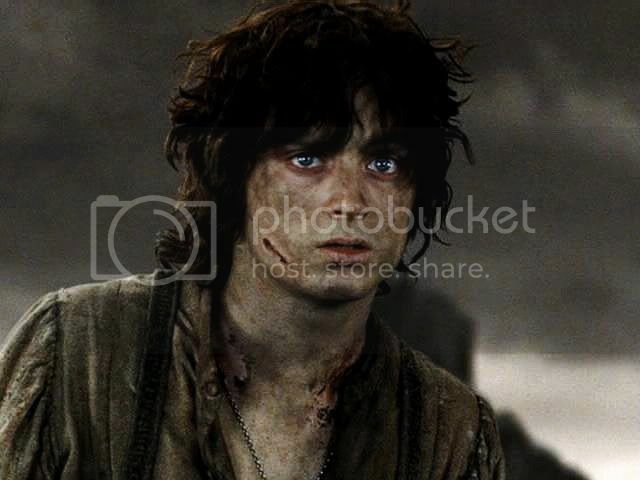 Every frame in the Mordor sections is like a painting. 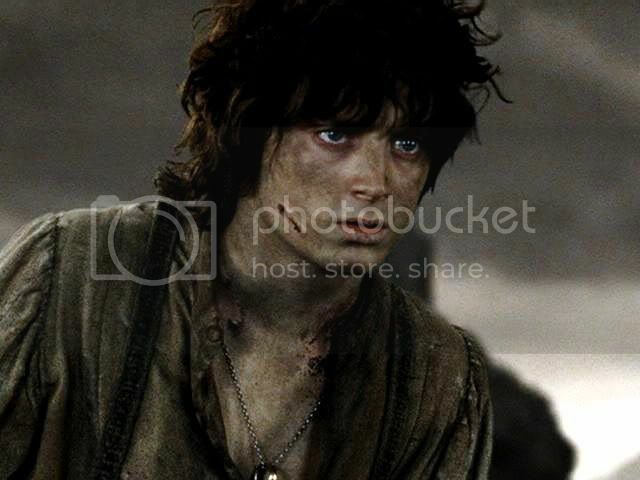 How could I not love them - even if I didn't love Frodo in particular? You can't really appreciate the "painting" quality of these framesthe way they are posted above, because they have had their sides cut off to make the featured face larger. For that I apologize. But they are all of them exquisite frames in wide screen. Thank you, Mews, for commenting. It is an extremely moving, real, poem, I think. I love the screencaps from this scene, too. Oh my. The text, photos, and poem combine to just break my heart... in a good way. What a scene! Shirebound, well-put: "heart-breaking, but in a good way." Isn't that so? That's the magic of LotR, really. It pierces the reader with every emotion, terrible and wonderful, but all to the good. 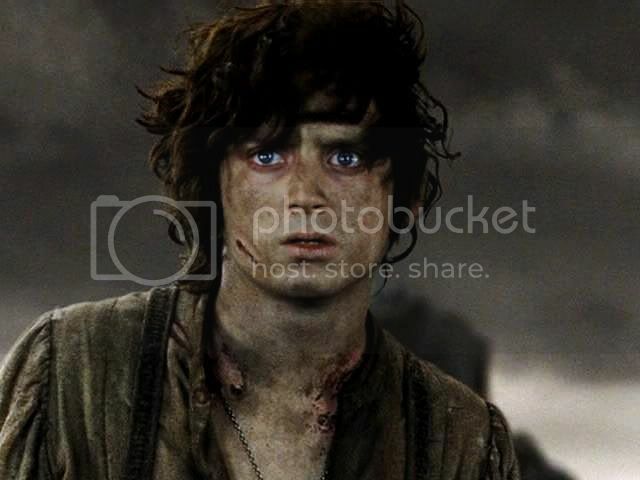 Seriously, though, what fan doesn't want to hold Frodo? 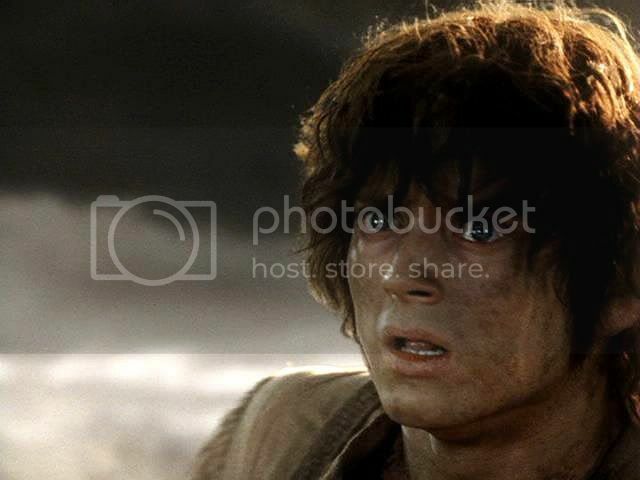 That's Sam's job - in part, anyway - being the person through whom we can hold Frodo. the whole thing is powerful...the screencaps speak the most profound moment for me when i totally fell in love with this movie and this actor. What I saw in these moments made me relook at the whole series of movies and then drew me to the theater 10 times, onering.net, many explorations, actually reading LOTRs and loving it. There was so much in this visual assault of pain and perseverance in comparison to the innocence in the beginning. I will definitly save this...I love the words with it. Why, thank you, Verangel. RotK made a huge impact on me, too. I was a reading fan of Tolkien from decades before, and the first two films made me a fan of the books at an even deeper level, reading all the rest of Tolkien's works and lots of secondary literature, as well. But I went...well...nuts after RotK. 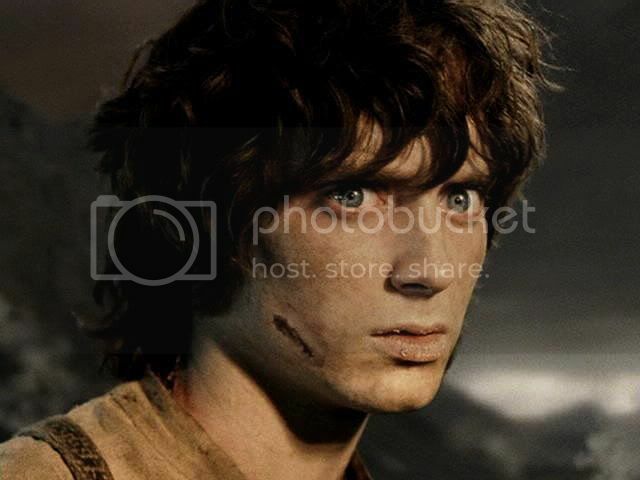 I fell in love with Frodo and became a messageboard devotee, having discovered LotR fandom. From there I found fanfic, then LJ. Yep, it made me nuts. Still am. I adore him swatting at shadows, and those vivid blue eyes that almost hurt to look at. This was a wonderful scene. Jan-u-wine's poem is tremendous. 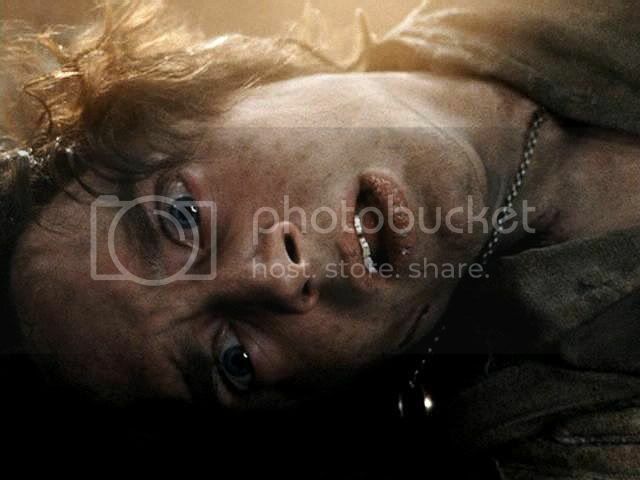 It really captures the pathos of the book and the intensity of Frodo's torment, which is as spiritual as it is physical. It is a tremendous poem, isn't it? At the end of Pt. 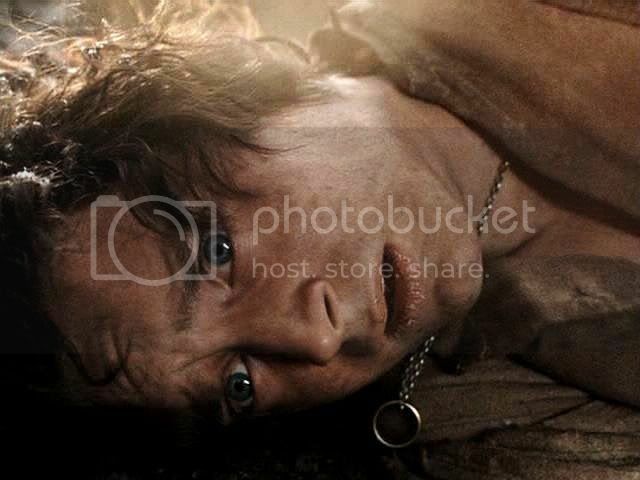 IV, I am posting links to three stories about this part of the book, Frodo suffering across Gorgoroth. They all are excellent, but none of them have affected me like this poem. Jan-u-wine is so good. 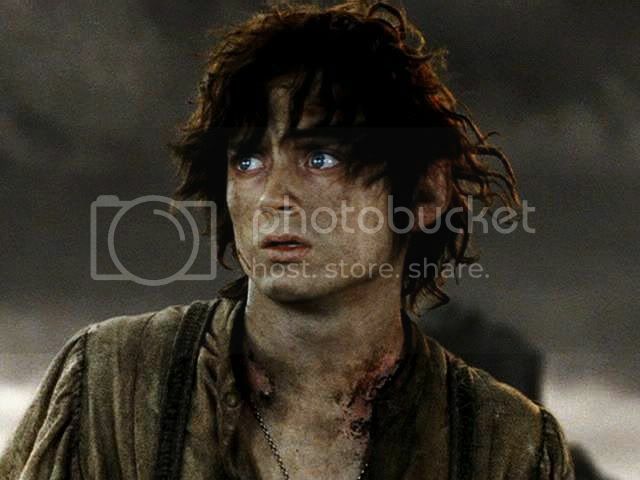 Her use of language and choice of images to portray the depths of Frodo's degradation and suffering does not spare him or us, yet it is done with delicacy and art. Ah, the vivid blue eyes are coming up, in Pt. IV. The dirt on his face seems to make them bluer. I loved the swats, too. They mostly were blurry as caps, which was why I didn't post more than the one image from that sequence. Your caps are exquisite, Mechtild - they just wring your soul! And Jan-u-wine's poem is very moving. She really has a good instinct for language, but also for its phrasing. Mech - I have only just found this, your latest offering. What a treat it is! Together with your previous post, this is another wonderful series of screen caps. Your comments, as ever, are thoughtful and perceptive. Jan-u-wine’s poem is the perfect accompaniment, painful though it is. 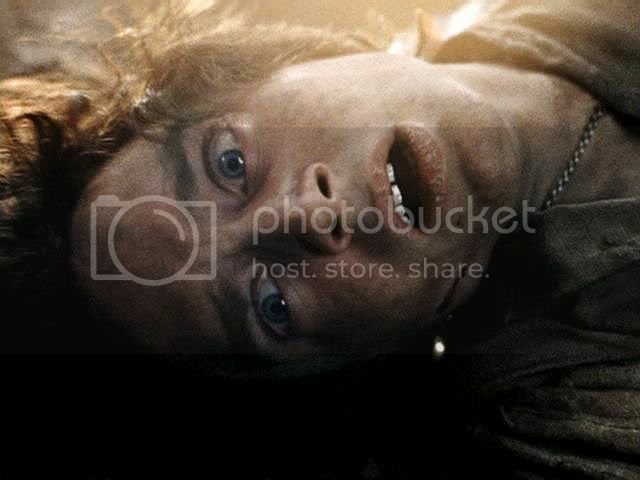 The ‘Frodo swatting at shadows,’ scene had a profound effect on me when I saw ROTK for the first time in the cinema. 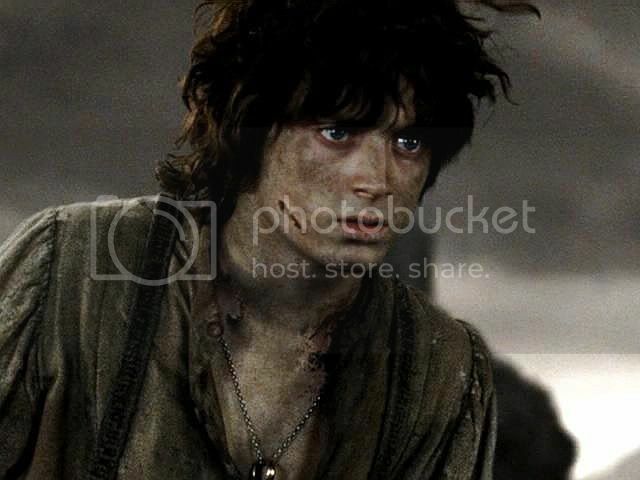 I couldn’t get that image of Frodo out of my head for days. I think Elijah’s heart-wrenching performance here reflects so effectively the book passage you quoted. Very powerful. Thank you, Blossom. Jan's poem really is wrenching - but true - and beautifully made. I think he's terrific in this scene as well. He and the filmmakers really brought that passage, that moment in the passage, to life.